Bit of a catch-up post as I should hit Paris tomorrow, and want to be up-to-date blog wise. I’ve come quite a long way in the last few days, well mostly today really, and am now firmly en France. Here are my routes and stats for the last few days. There are 3 entries for 14 June, due to my Garmin crashing twice; it sometimes freezes when I’m using it to actually navigate somewhere, rather than just record my route. Last night I’d only been thinking nothing had broken in a while, so it wasn’t really much of a surprise to find myself fixing one of my rear panniers before setting off in the morning, or that my tent zip had broken; I’d have a go at fixing that later. Luckily I’ve brought some spare bits for my panniers, and could replace the bolt that had pinged off somewhere from the rack attachment. 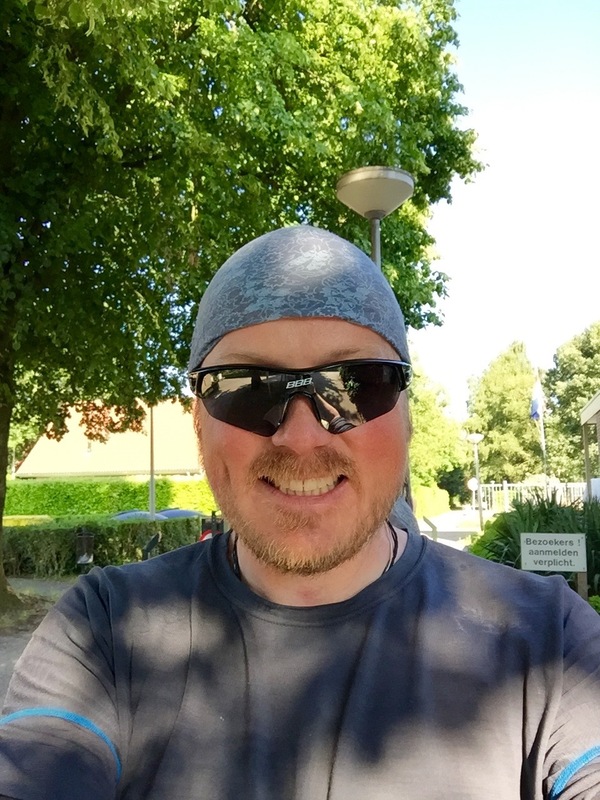 Today was a sort of rest day anyway, in that I wasn’t intending to go very far; ended up covering about 70km, in 4hrs 30 mins, so still went a fair distance in the end. After mending stuff I packed up slowly and said goodbye to River and Eugene, who left for the airport & Barcelona, and Amsterdam respectively. Good luck guys! 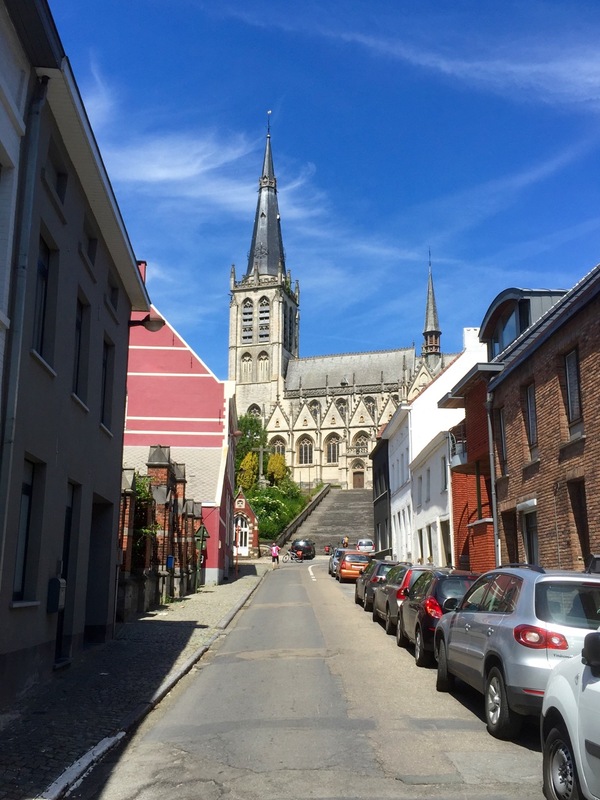 First stop for me was Brussels, which is only about 10km down the road from Grimbergen. Getting into the city was pretty straightforward, and I had a good walk around, taking in the central square in the old town, and cathedral. It’s always tricky in a busy city, packed with tourists taking photos and moving about randomly, when you have a heavy bike to deal with, but I made it through. The Friteries smelt very tempting, but the queues were massive and not really an option with the bike; one of those occasions when you need a travelling companion – Lobster just doesn’t cut it in these scenarios. As well as all the other people taking photos I took a few, here is a selection. I might have labelled some of those wrongly, and would welcome any corrections; I’ll try to look them over again when I have more time. Brussels is certainly a melting pot of cultures, and a great place to visit. I guess it puts Belgium on the map, it being the seat of the European Parliament and where Nato is based. There’s a buzz to the city, and it’s definitely on the list to come back to at some point. It was great to hear people speaking French too, as well as signs being in French; finally a language I’m more familiar with. To be fair though I heard all sorts of languages being spoken from Flemish and French, to English, German, Italian, Chinese and several others. After a couple of hours I tried to extricate myself from the city, which was easier said than done. It took me about an hour to get to the outskirts and on the road to Waterloo, with a lot of bumping about on cobbles, and getting stuck in traffic. I also had to be very careful not to get ensnared by tram lines! A strange thing happened as I rode South; I started encountering gradients, hills had entered the fray once again. It was actually very nice to pedal up and down a few hills after mostly riding across flat landscapes for several days, and you get more variety on the scenery front. 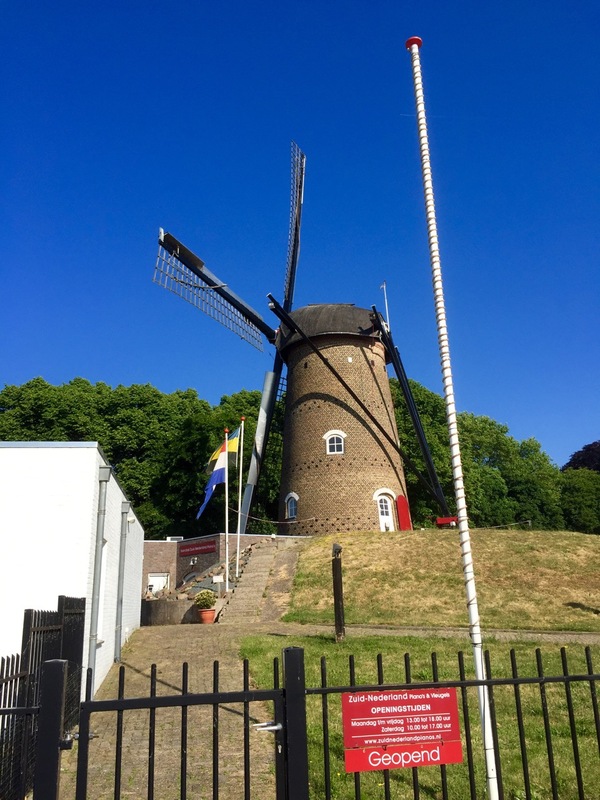 I rode on to the town of Waterloo, bumping about on the unfriendly Belgium roads, stopping briefly in the town where there are a couple of museums, before pedalling on to the Butte du Lion, the site of the Battle of Waterloo. 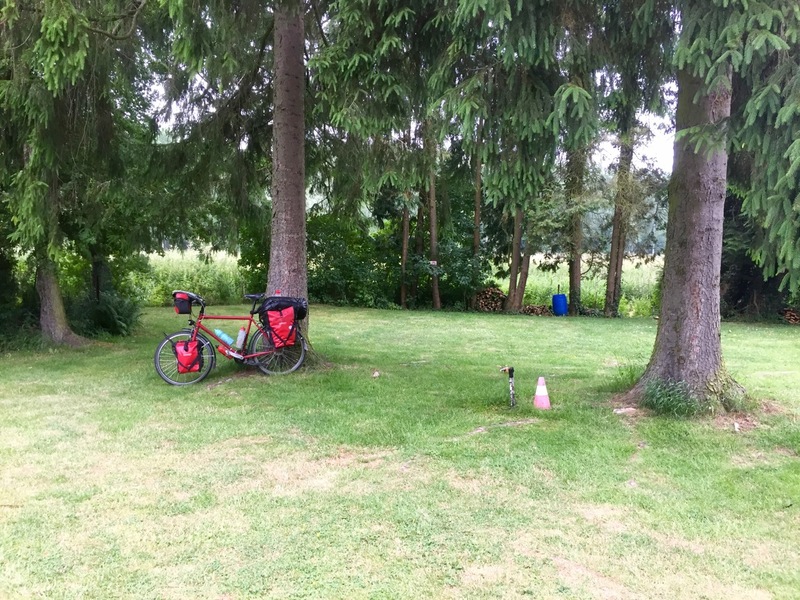 I continued through the countryside, passing through Nivelles towards Charleroi, stopping at the Trieu du Bois campsite in Luttre, just down from Pont-a-Celles. 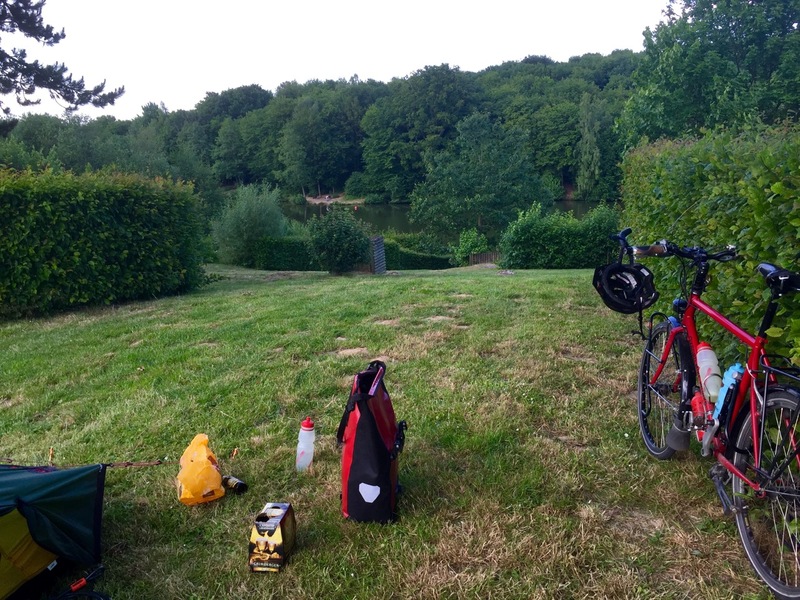 After a relatively easy day, despite the bumpy roads, it was nice chilling out at the campsite; a tranquil spot next to the Brussels-Charleroi canal. The campsite owner brought me a chair; a total luxury for a cycle tourer. I also managed to fix my tent zip, which wasn’t easy but came as something of a relief. 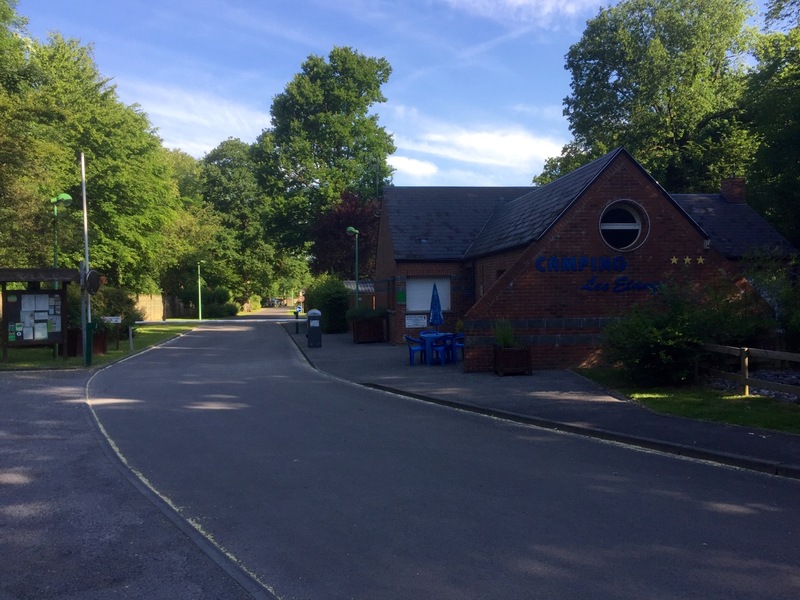 I’d definitely recommend this small but lovely campsite if you’re in the area, good wifi too. 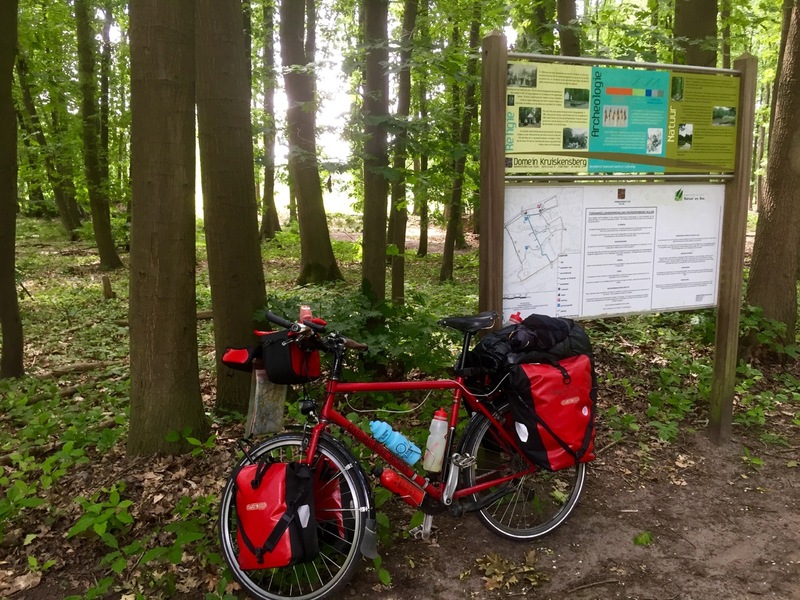 I chatted to a couple of French cycle tourers from Lille, on their way to Namur, and a Dutch motorcyclist on his way home and intending to ride 1,000km tomorrow; bit further than I’ll manage. Also did a bit of beard maintenance, keeping it for the time being, and fell asleep listening to the sound of lots of frogs going ribbet. Bit further today; 97km covered in 5hrs and 45 mins. I noticed my front tyre was flat when I emerged from my tent, so I had to fix that before getting on the road. I just used a new inner tube this time, but found the puncture in the old one, which is already patched; a tiny pin prick whole which I can patch later. I couldn’t find what caused it which is always a worry, as it might still be in the tyre. The two French tourers left before me, as did the Dutch motorcyclist, however I wasn’t far behind them despite the puncture. 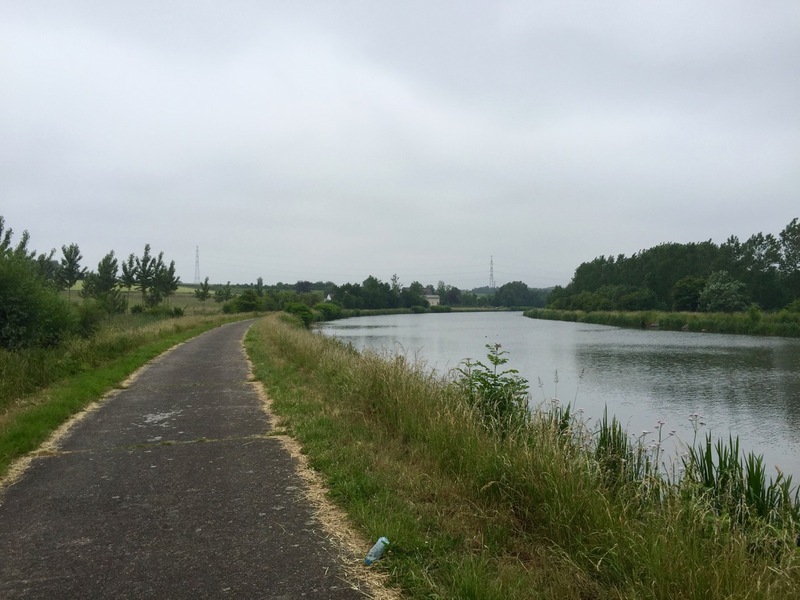 i turned right out of the campsite onto the canal path, hoping it would take me to the centre of Charleroi; it looked like it should. 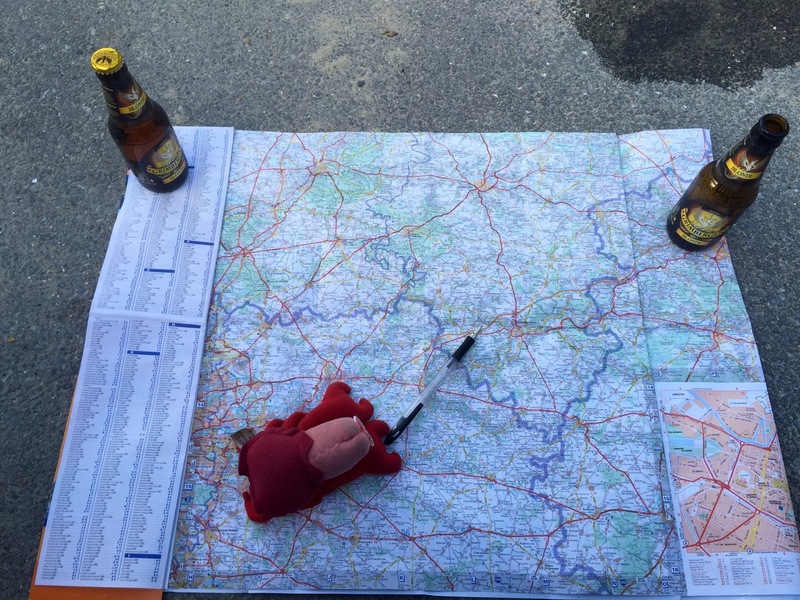 I caught up with the French tourers on the outskirts of Charleroi, as they tried to find the route to Namur. I was similarly confused in my attempts to get into the city. The cycle path signposts had vanished, and the canal path I’d been followed stopped at a factory. I eventually made it into the centre but really shouldn’t have bothered; it was a bit like making my way into a more industrialised version of Mordor, and I’m sure I passed a gateway to Hades at one point. 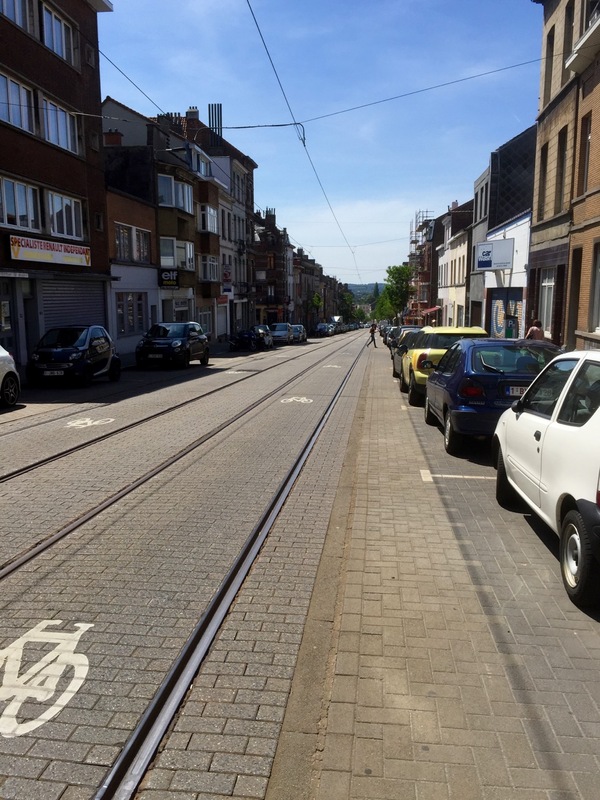 Charleroi – entrance to the Underworld? Charleroi itself wasn’t much better, but I felt a sense of achievement at having penetrated its defences and making it to the Crack of Doom; could’ve done with the Eagles coming to carry me back out of the city though. It’s a bit of a dead place, very industrial which harkens back to its origins, but now just dirty and smelly with not much greenery. Maybe the overcast day didn’t help, but I’d been hoping for a bit more as I joined up with Eurvelo 3; didn’t see any signs for that by the way. I made my way out by roughly the same route, but on roads as opposed to the canal paths; they were busy, narrow, and had lots of lorries. Thankfully the situation improved when I reached a lovely canal path, starting at Landelies (I could have probably joined it earlier if there’d been adequate signage), and staying on it all the way to Thuin. 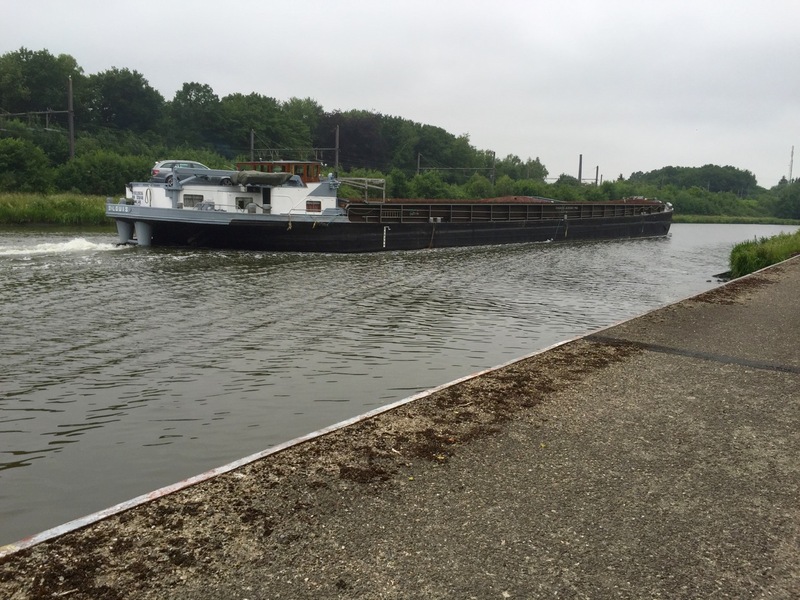 The canal path wound through forested hills, with the occasional lock, a few boats chugging along slowly, and no traffic; bliss after Charleroi, which on a good point provided an excellent contrast. 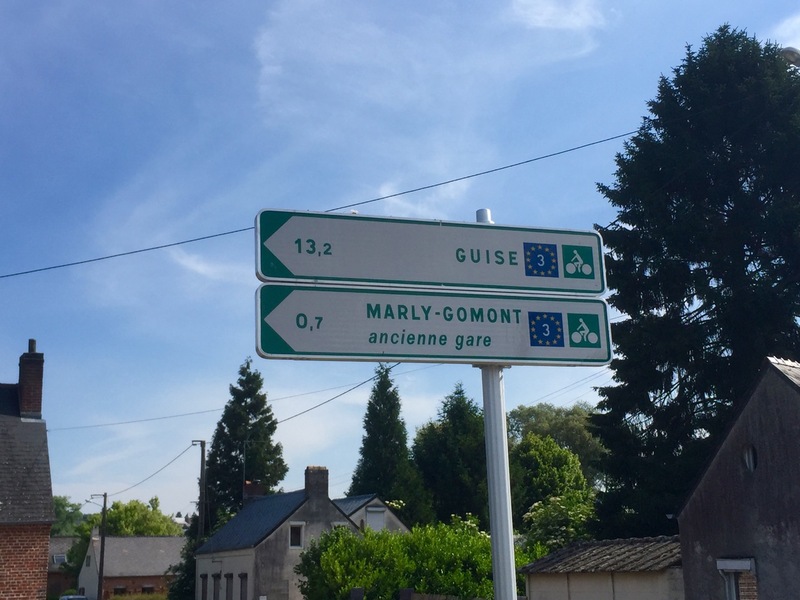 After lunch in Thuin I cycled South West to the border with France, crossing at a small village called Bousignies-sur-Roc; there were no signs to suggest I’d entered France, however my phone changed to a new provider and I got a text alerting me to the fact. The rest of the ride down to Fourmies was very pleasant, if a little hilly in bits (legs coped fine), however the roads were much smoother compared with Belgium, and it felt good being in France finally. 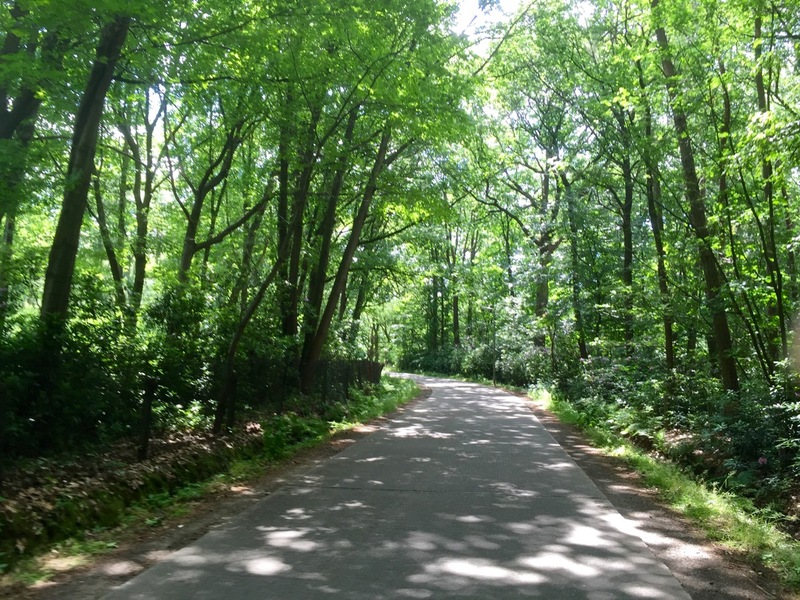 I pedalled through a big forest; Parc Departmental du Val Joly, where there are wild boar, wild cats, deer, and all sorts of other Flora and Fauna. I stopped for a banana break; Lobster spotted a squirrel but little else. 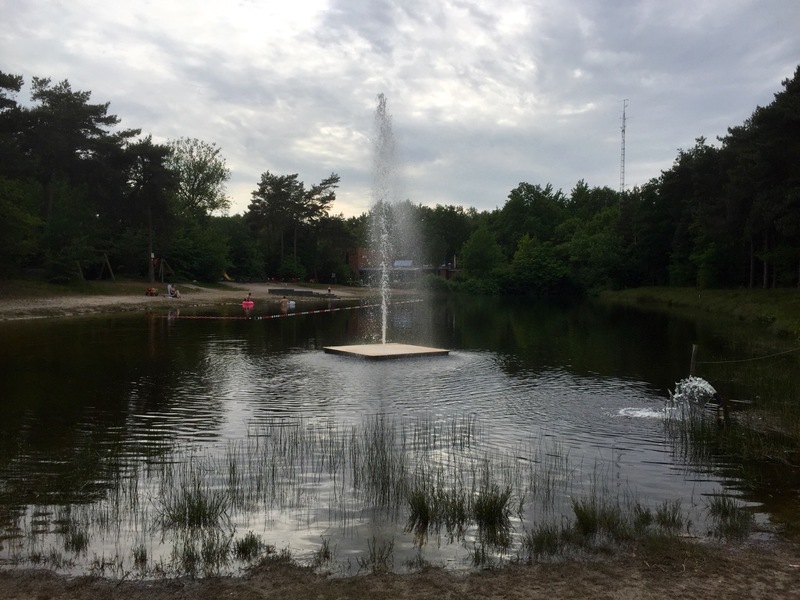 I stopped in Fourmies, and the campsite at Etang-des-Moines, having made fairly good time; only €9 for the campsite too. After setting up I nipped to le Supermarche then feasted on salad, pasta, bread and nearly a whole Camembert, fruit, chocolate, and a few Grimbergen Blonde beers; a worthy meal to celebrate a new country. I’m glad to be in France, a country I’ve always been comfortable with, perhaps because I can speak more of the language, but also because I lived in Marseille for nearly a year. I like the lifestyle and people, and am looking forward to the next week or so as I make my way to Spain, then the leg along the Mediterranean coast post Tarifa. The campsite was quiet so I spent the evening route planning and relaxing listening to music; the North Easterly wind made it a bit chilly so it wasn’t long before I burrowed into my tent. Today’s been a great day; 142km in 7hrs and 20 mins, riding down smooth and quiet French roads – sorry Belgium, it was good to visit, and there were bits I liked, but I’m not sad to leave. I left the campsite in good time, at 08.30, feeling energised after last night’s feast and finishing off the Camembert for breakfast. From Fourmies I rode down to Wimy, and stumbled upon a Eurvelo 3 sign, will wonders never cease?! With sun shining it was a lovely ride down the cycle track, all the way to Guise. I had the path pretty much to myself, aside from many cows in the surrounding fields. It wound through woodland as well as fields of corn, and the occasional village. 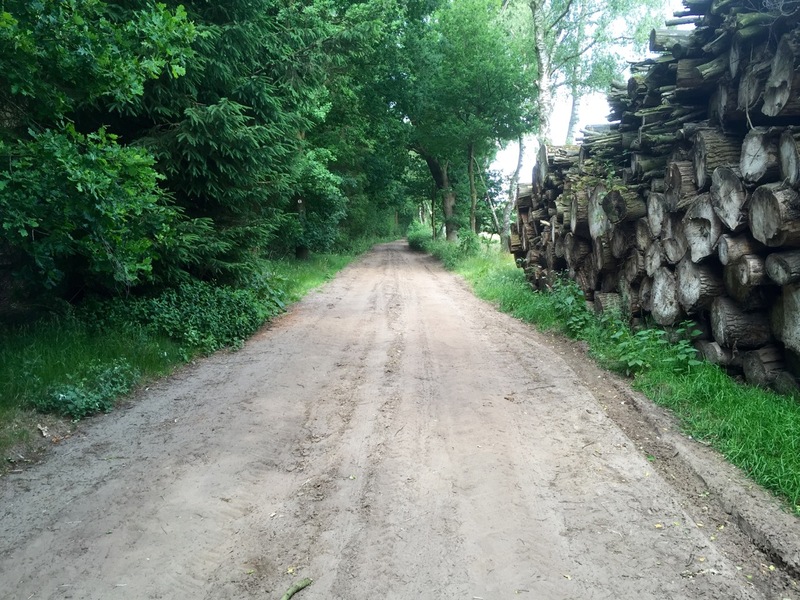 I’m wondering if it was an old railway track as it was pretty flat, and made for easy riding, aside from the gravel surface which was a bit grating and kept flicking up under my mud-guards. My chain slipped a couple of times, probably because of the gravel, but it reminded me that I need to get it changed when I get to Paris. After Guise I continued on through the countryside to St. Quentin, and had a break for lunch; loving the boulangeries! St. Quentin is a lovely city, with a few poignant reminders of World Wars 1 and 2. It was a bit of a diversion to visit St. Quentin, but worth it. From there I rode South West on a long but very enjoyable ride towards Compiegne, passing a number of war cemeteries which made me reflect on how lucky we are in more recent times, and how I can ride through countryside enjoying myself in an area which was once the front line in two fierce wars, with so many killed and injured; I realise there are some horrible wars going on in other parts of the world but this bit is nice. 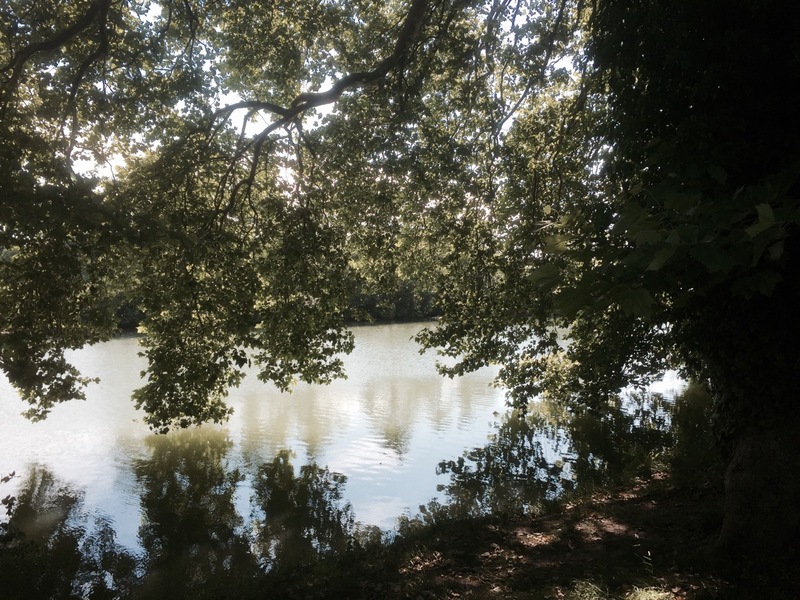 I didn’t go all the way to Compiegne, instead turning South to Vic-sur-Aisne and the La Croix De Vieux Port campsite. Before getting there I had to negotiate a few particularly steep climbs, which were difficult in the heat and after 120km already done; a road signposted up the ‘Old Mountain’ (nears Cuts) filled me with apprehension, but it was lovely and shaded, and I stopped for a break at the top. La Croix De Vieux Port proved to be a great campsite, with a €10 special rate for cycle tourers. The owner also complimented me on my French, so it can’t be too rusty, and showed me to a quiet camping area away from the masses; there are a lot of Brits on holiday here, and it’s been nice chatting to a few. The site has a restaurant, pizzeria, bar, swimming pools, bowling and lots of other stuff by the looks of it, and would be quite a good place for a family break judging from all the children and their slightly exasperated parents chasing them about. 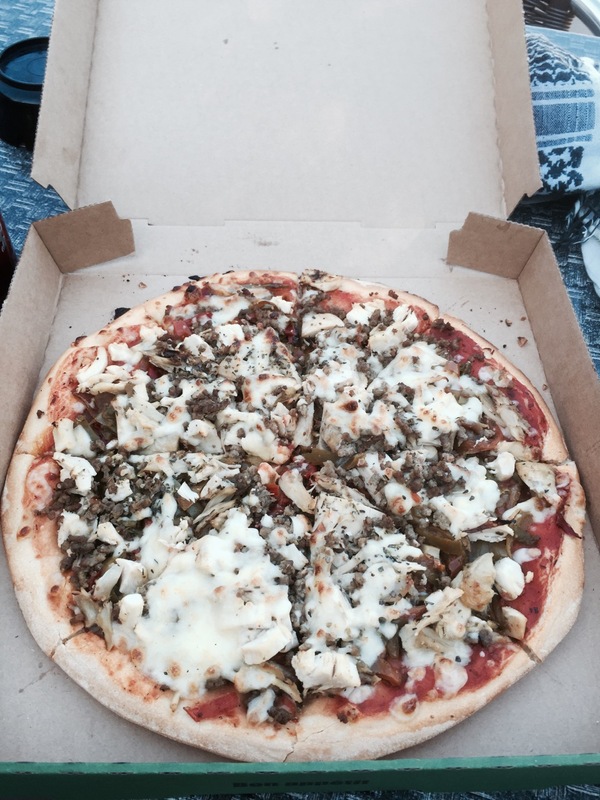 I relaxed and had a pizza; could’ve eaten two and might go back for another in a minute. I’m thinking about stopping in Salamanca for my birthday, a reasonable distance to pedal between now and 05 July. I could probably get further but need to throw in a day to get the bike serviced, and might incorporate a few detours when I get to Spain. 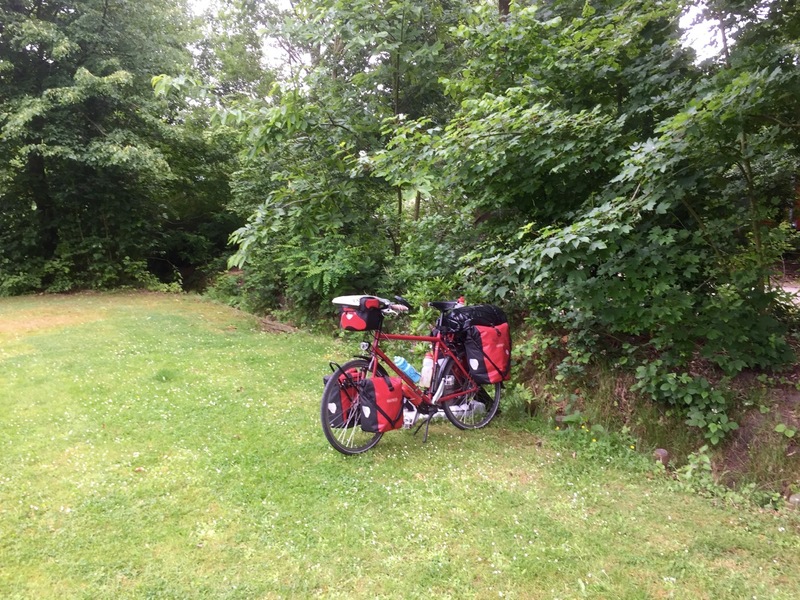 Tomorrow it’s on to Paris and hopefully a campsite on the edge of Bois de Bologne; I shall probably have a rest day there to do some wandering about, and get a new chain and rear cassette fitted. Does anyone have a recommendation for a good bike shop in Paris? There must be loads. 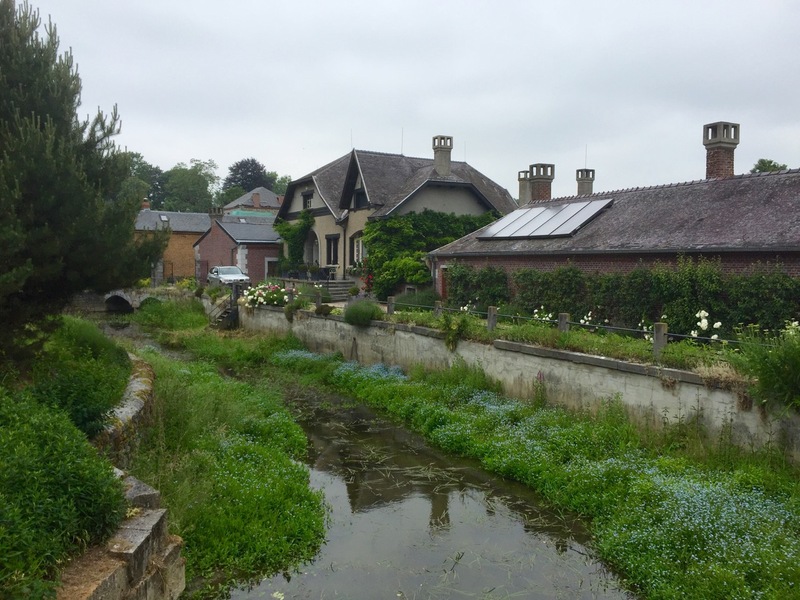 This entry was posted in Belgium, France, Self Propelled 2015 and tagged Adventure, Belgium, Bicycle Touring, Bike, Charity, Countryside, Cycle Touring, Europe, Expedition, France, photos, Self Propelled 2015, St. Quentin on June 16, 2015 by SelfPropelled. The 12 June saw me cycle 117km in 6hrs and 45 mins. It was already hot when I was packing up, so I knew I was in for a scorcher. The temperature has rocketed over the last few days, got to 22 degrees Celsius by 10.30, and over 30 degrees Celsius shortly afterwards. You don’t notice it on a bike so much as you have a constant draft, but it’s hot when you stop, and you have to remember to drink a lot of water even if you don’t feel like it. I attempted to pay at reception on my way out of the campsite, however the owner just waved me through with a smile; very nice of him and a bonus night’s free camping! I’ll put the money into the beer kitty. From Alverna and Nijgemen I made my way South West following cycle paths and ‘Nodes’, with a little help from my map. 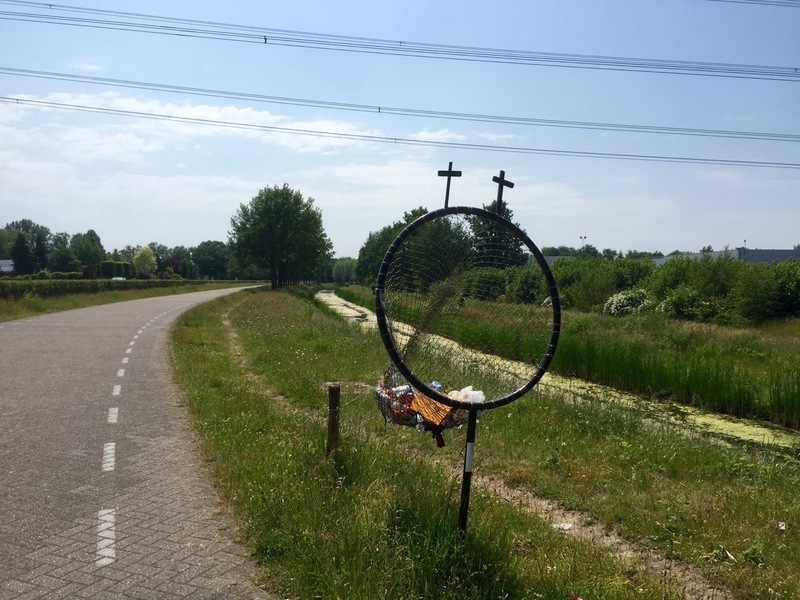 There were a couple of confusing bits when I mixed up numbers, however all-in-all the cycle network in Holland works really well, and the paths and roads are lovely and smooth. I don’t have any complaints about the drivers either, mostly because I wasn’t on the road so didn’t encounter many, however the few times I did they gave me priority and were courteous. In Holland they have strangely shaped objects by the side of the road that I was initially unsure as to the purpose of; they’re bins, and perfectly positioned and angled to throw stuff in as you’re cycling along, an excellent invention. Some are metal and some just have nets; here’s one of the latter. I stopped for a refuel at a convenient McDonalds about 11.30, feeling hungry after a meagre breakfast, but also because they have air conditioning and free wi-fi. I hadn’t realised quite how hot it had got until I went back outside. Shortly afterwards I was pedalling into Eindhoven, an old city but one that appeared very modern. I walked through the centre, which was bustling with activity, but as mentioned in my post yesterday akin to most big metropolis; same shops etc. After Eindhoven it was on to Reusel, and across the border into Belgium. It was a slightly longer ride than anticipated due to the cycle route going a different way to my planned route, however still got me to the right place. As I rode along I contemplated what would/will happen if/when the sea level rises. 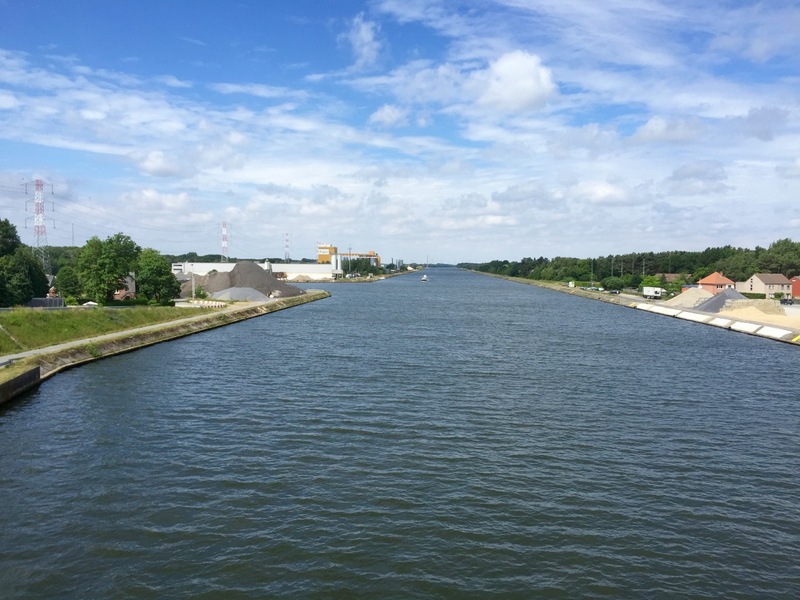 I’ve been pedalling across a lot of flat land, over bridges, rivers and canals, and a lot of it is only just above, or even below sea level. I believe Holland has some major sea defences however I fear they’ll need them in years to come. 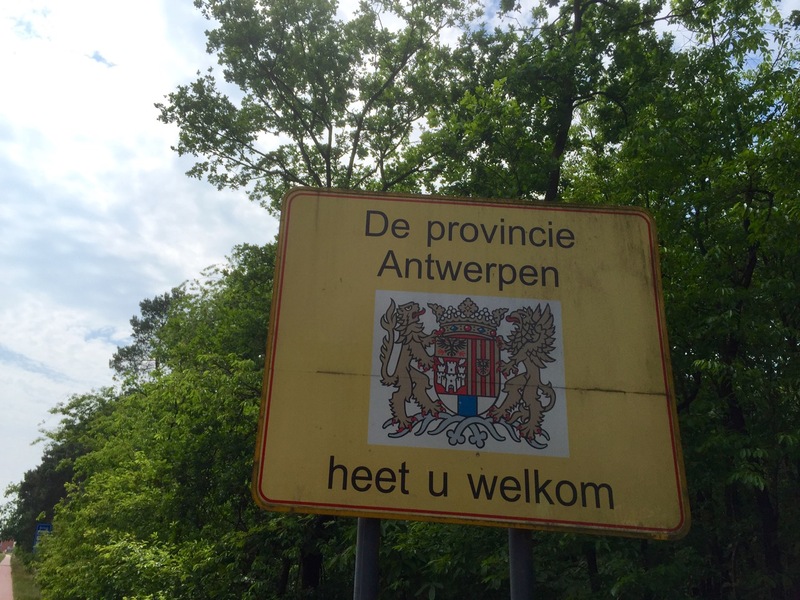 They speak Flemish in this part of Belgium, so I’m still resorting to English, however I can switch to French a bit further South; probably once I reach Brussels. 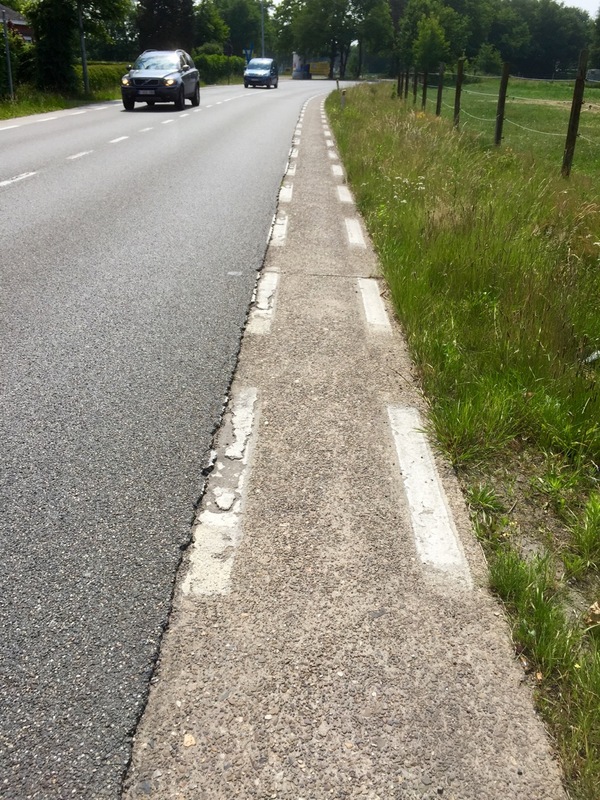 Once I’d crossed the border I unfortunately noticed an immediate deterioration in cycle paths, and road surfaces in general. I think I’ve grown used to the luxuries of Holland, and to only a slightly lesser extent Germany, and will need to toughen up again. Passed a great horse-drawn bus just inside Belgium, being steered with much enthusiasm by a slightly crazed looking and sounding driver; could have been something out of Harry Potter. 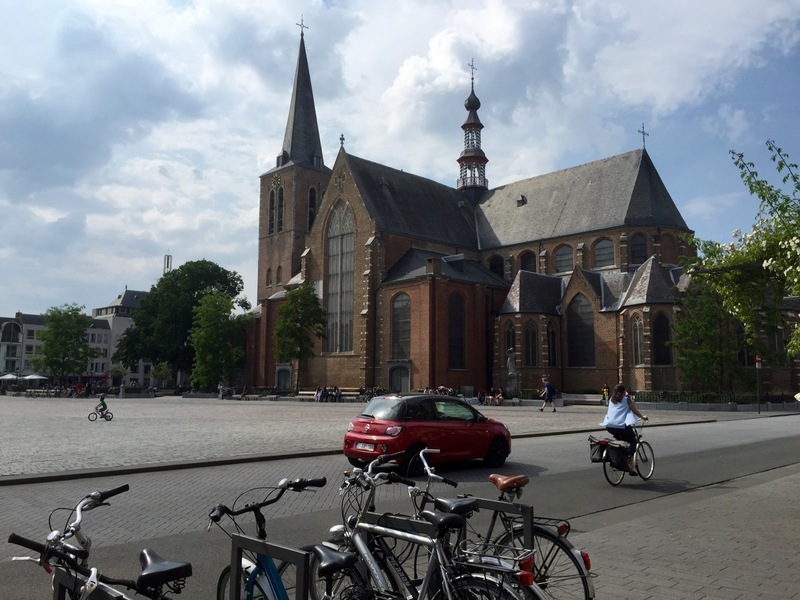 I passed through Arendonk, and on to Oud-Turnhout where I stopped to buy supplies at Lidyl. They had tonic water going cheap, which was really refreshing and helped lessen the irritation from hay fever; I think the pollen count is really high at the moment and I’ll have to visit a pharmacie to get some anti-histamines. When I get to a pharmacie I’ll also pick up some anti-chafing unguent, having discovered I left my chamois cream in Stockholm. Now the weather has gotten hotter I’m likely to need it more, having felt the first signs of rubbing today; something to avoid at all costs. 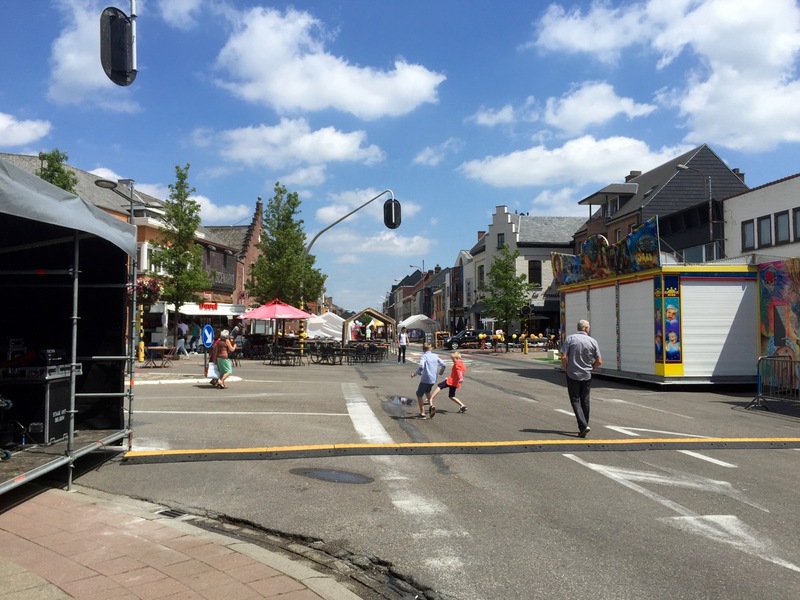 I made it through Turnhout, passing lots of people sitting out in bars in the main square enjoying Friday afternoon and no doubt the evening to come. 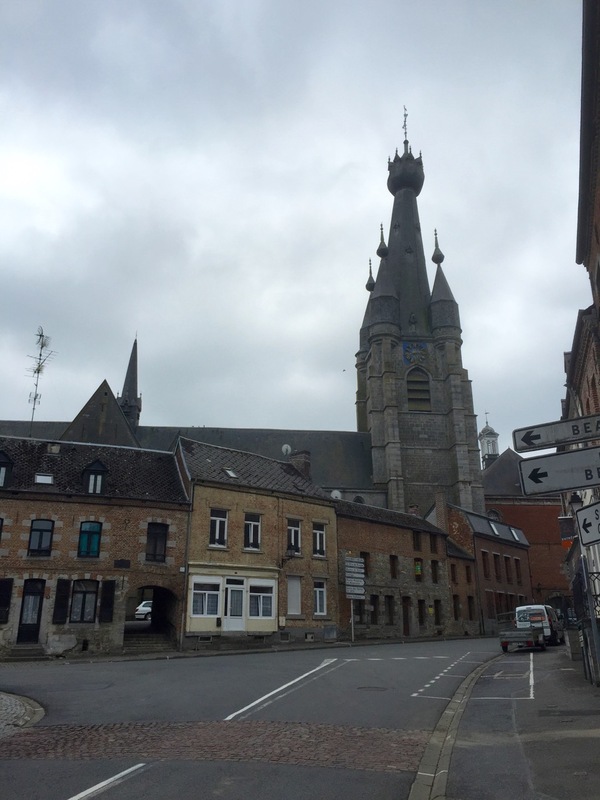 I noticed a French look to the town, despite this still being a Flemish area, but it might just be my imagination. Then it was on to the campsite North of the town, near Ravels; Baalse Hei which I found via ACSI. I used my Garmin to navigate to it, and ended up going a slightly strange route, involving some sandy paths which were impossible to cycle on. It reminded me of one of the initial days of my Bike around Britain tour in 2013, when I tried to cycle down a sandy path on the Norfolk coast and promptly did a stunt (=fell off my bike). The campsite was a good one, and slightly more populated than the previous. I pitched up as a thunderstorm hit, which didn’t come as a complete surprise after the hot day, and was quite refreshing; my top needed a wash anyway. After the au-naturel shower I thought I’d better have a soap based shower, then nipped to the campsite cafe for a lasagna, salad and chips before it closed. They have free campsite wide wi-fi so I was able to retreat to my tent once the cafe closed, to update my blog and plan tomorrow’s route; also caught up on the news as I’m completely out-of-touch – not a bad thing probably, however the Greek situation is worrying, as is MERS. 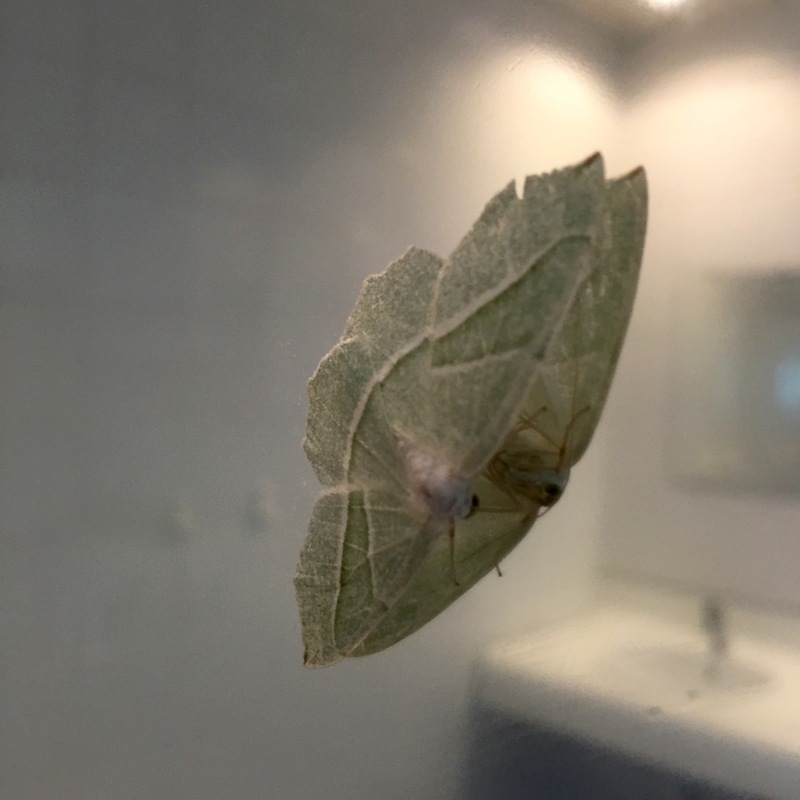 The moth was one of the friendly insects, most of the others were a pain; midges and mosquitos, which was the main reason I hid in my tent. Before shutting out the insects I had a quick chat with a German cycle tourist on a short break, reliving a tour from about 20 years ago; he was describing how things had changed, and some of the language difficulties. 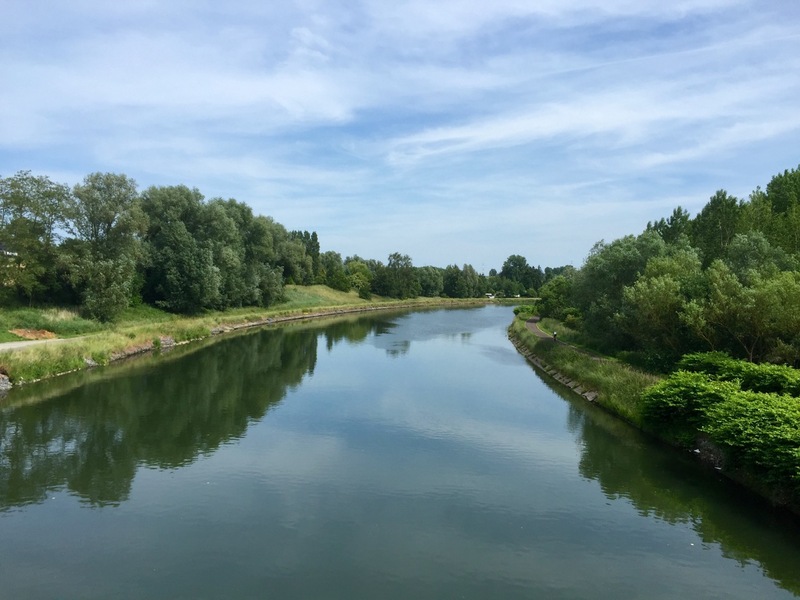 My route planning culminated in a decision not to head to the coast and work my way around to Spain, but to head down to Eurovelo 3 at Charleroi, the Pilgrim’s route, and work my way through central France via Paris. So it’s on to Grimbergen, close to Brussels, tomorrow. I’ll need to buy a new map. I pedalled a meagre 82km on 13 June, in just over 5 hours, but it was all I’d planned on doing in any case. 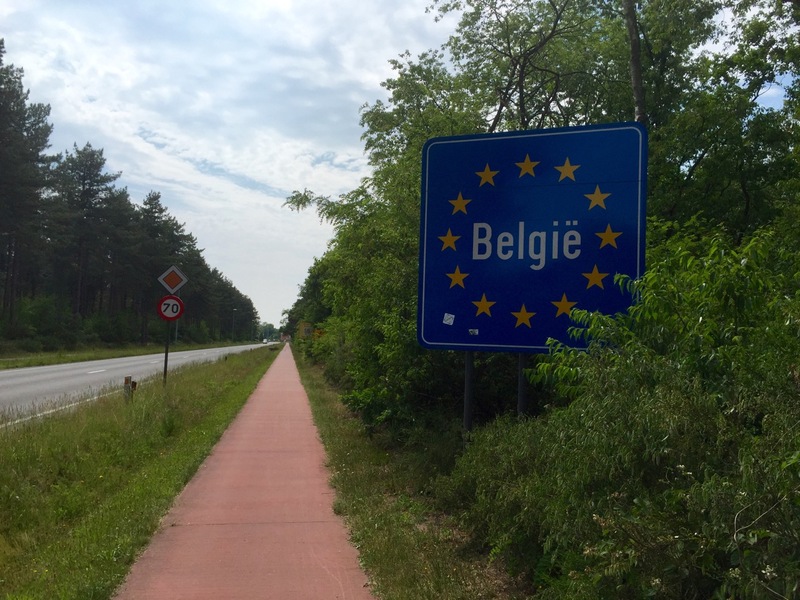 I’m also suffering slightly from BRF (Belgium Road Fatigue); they’re a lot more bumpy than the ones in Holland and Germany. The cycle tourer I just met, from Taiwan, totally agrees, and has the same problem with slightly painful hands and wrists after riding for a while, because of all the jarring. 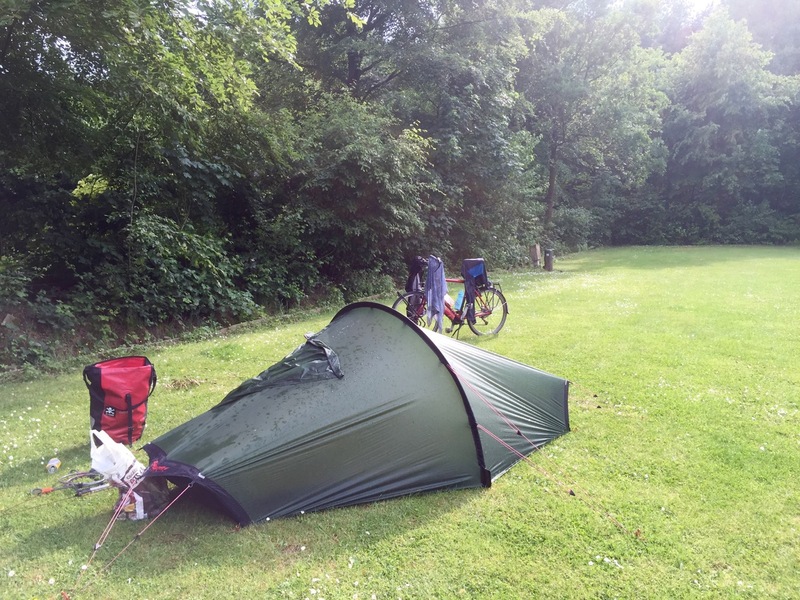 After a dry night it decided to rain as I packed up, typical, however I just got on with it and was on the road by 10.00, leaving Baalse Hei campsite and heading back to Turnhout, taking a more direct route back into the town than last night’s slightly adventurous trail. As I rode South West the rain stopped, but it remained overcast for a bit, which was pleasant after yesterday’s heat. I crossed several canals as I pedalled through the countryside to Mechelen, a moderately sized town/city, not sure which. 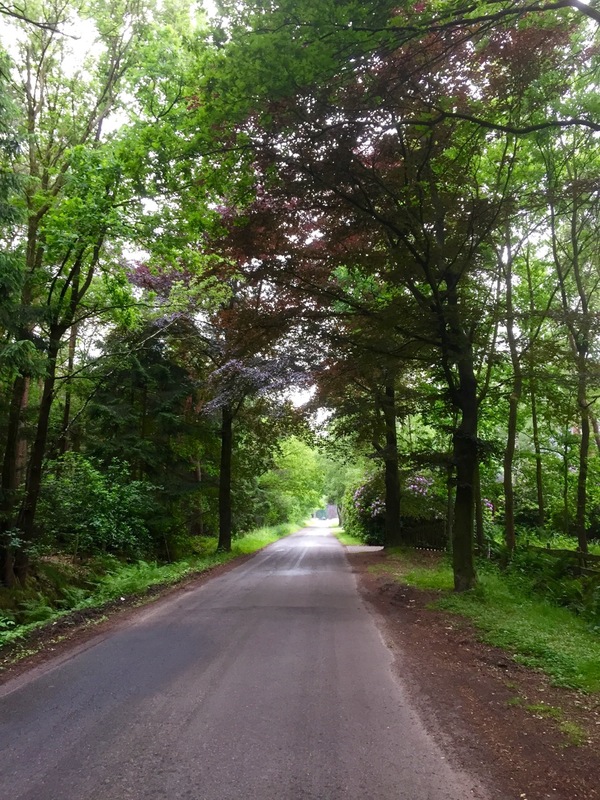 I’ve had to cycle on the road more in Belgium, and have noticed the drivers are becoming more like I’m used to in the UK; faster, less patient and more aggressive. This is no doubt a sign of things to come for the rest of the tour, as it’ll only get more frenetic as I head South. 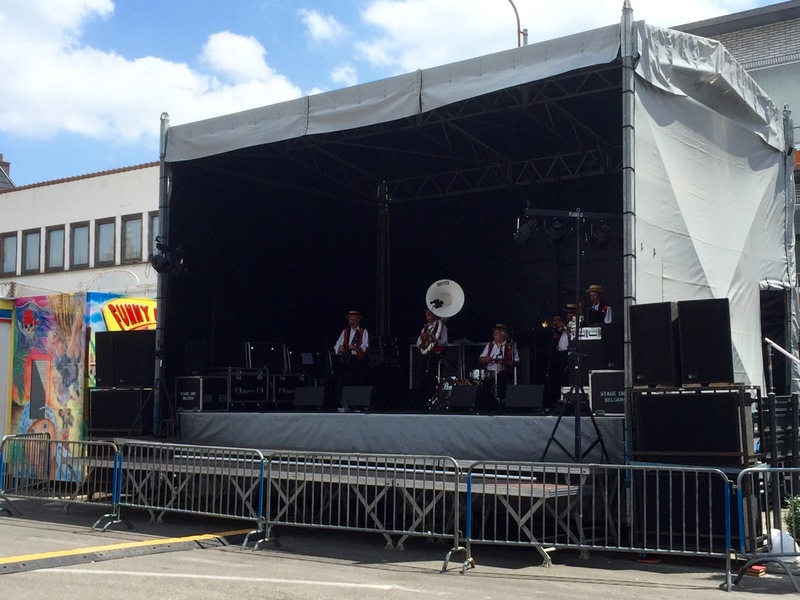 I passed through Putte, where the main street was closed for a fête of some description. There weren’t many people about despite all the stands. I stopped for a break and was the only one listening to a band playing ‘Blue Moon’, very well as it turned out; had it in my head for a few hours after that. They appreciated my solitary applause in any case, but it all felt a bit odd without even the semblance of a crowd. Anyway, where was I? Skipped back and forward a bit there, however here are some photos of Mechelen; some nice buildings, lots of flags, and lots of people sitting out in cafes. I cycled on towards Grimbergen, my destination for the night, over a few more canals, and passing some donkeys just taking it easy in the good weather. I was overtaken by yet another cycle club out for a Saturday ride, this time a large peloton; they didn’t bother using the bumpy cycle paths which would no doubt break their carbon road bikes quite quickly. I’ve mentioned the roads and cycle paths being bumpy already, and this continued to be the case, making me a bit tired and grumpy; the headwind and hay fever wasn’t helping either. A lot of the roads are made out of large concrete slabs, with joins every few metres which give you a regular jolt; annoying after a while. Grimbergen proved to be a lovely small town, and very convenient for Brussels the following day. The campsite was the only one I could find in the area, is cheap, and had everything I needed including wi-fi near reception. 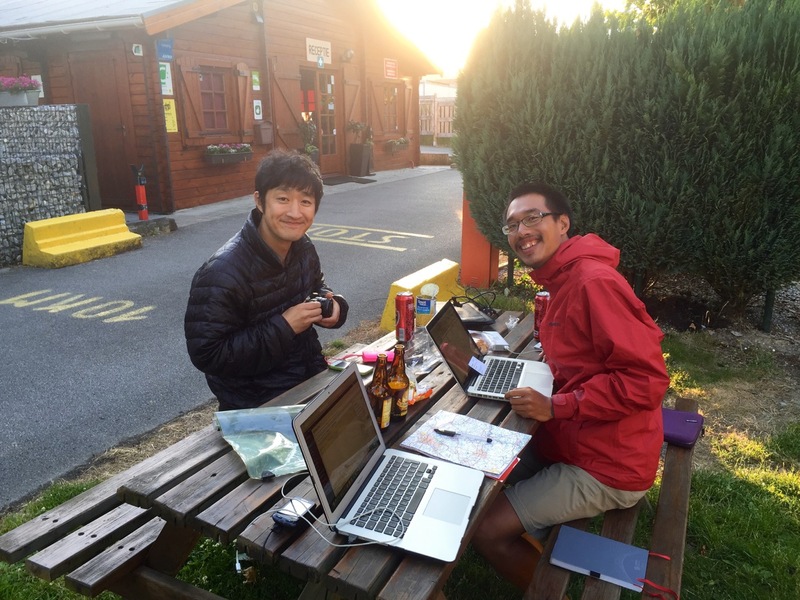 Almost immediately I met River, from Korea, who has been travelling the world for a few months visiting China, South America, the USA, and now Europe. He’d flown from Miami to Brussels last night, and is due to fly to Barcelona tomorrow; a bit random but the flight worked out cheaper that way. River works in restaurant in Seoul, but has decided like me to have some time off to explore and have an adventure; his restaurant sounds excellent, and he makes his own beer, so I’ll be sure to visit if I make it there some day. 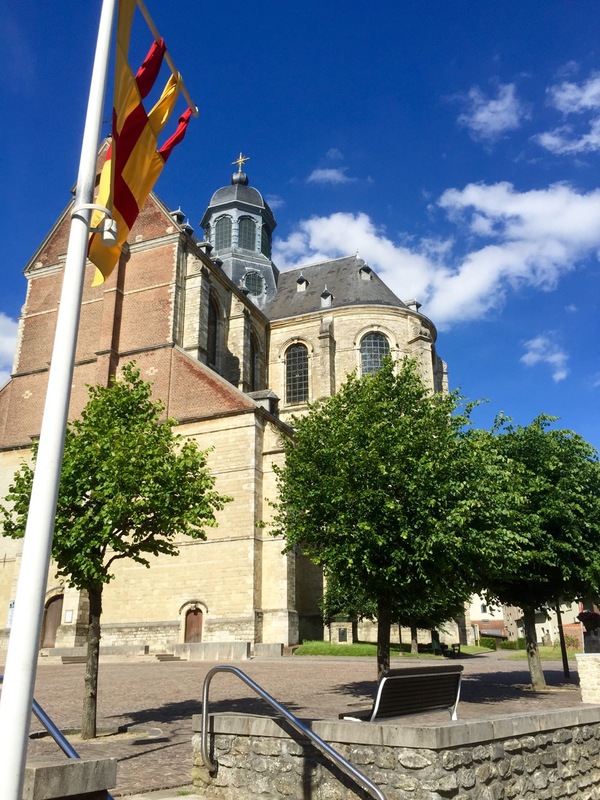 We walked into Grimbergen to explore and pick up a few supplies from the supermarket, and enjoyed a cold beer in he sunshine. 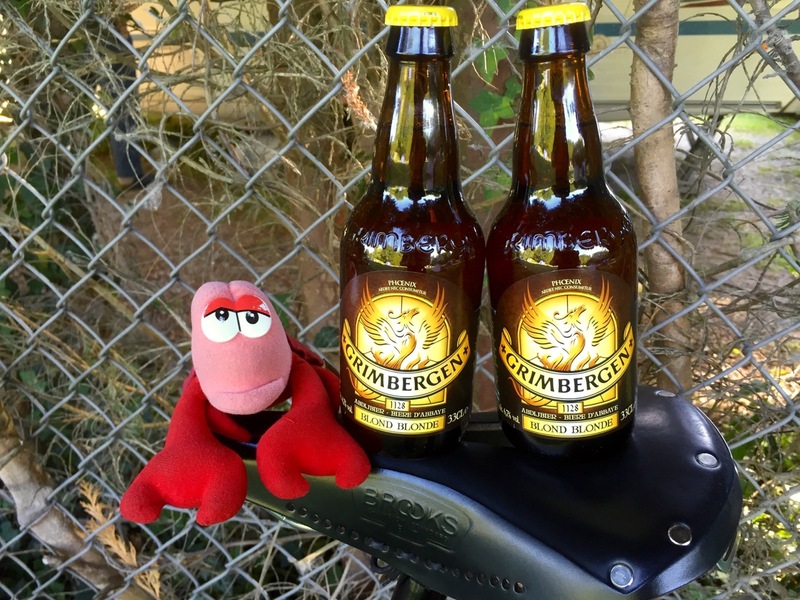 Grimbergen is famous for brewing beer, and I picked up a couple of local ones to enjoy back at the campsite. The weakest I could find was 6.7%, and they went up to well over that (10% +), alongside some Trappist brews. There’s a beer museum too, but we thought we’d enjoy drinking it rather than reading about it. River told me a bit about his time in South America, which reinforced my desire to visit there one day, preferably on a bike. It sounds friendly, cheap, full of life and things to visit. He found the USA quite different; expensive, and unfortunately the people were colder, unless you paid them. He also mentioned the MERS virus which has hit Korea, and I’d read about last night; hope it peters out soon and no-one else dies. Back at the campsite we met Eugene, a fellow cycle tourer, from Taiwan. He’s been pedalling around Europe for the last 6 months since finishing his PhD, starting off in the UK, and going all over the place since then. He’s only got a couple of weeks left before going back to Taiwan, then on the America to work. A great evening was had, where I think we convinced River cycle touring is the way forward. Tomorrow I’m off to Brussels, then South towards Charleroi and Eurovelo 3, whereas Eugene is pedalling North towards Amsterdam. River of course is flying to Barcelona, and after that who knows, however it’s possible he’ll walk some of the Camino de Santiago so I might bump into him again; he might have to get a new tent before then, as his one from Wal-Mart, which he was extolling the virtues of, was apparently a bit drafty and chilly overnight! 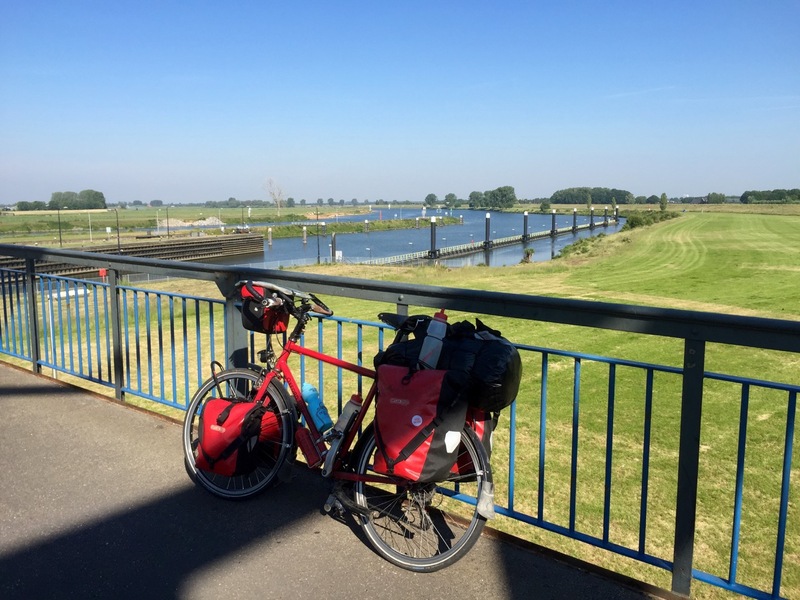 This entry was posted in Belgium, Holland, Self Propelled 2015 and tagged ACSI, Adventure, Belgium, Bicycle Touring, Bike, Countryside, Cycle Touring, Europe, Expedition, Holland, photos, Self Propelled 2015 on June 14, 2015 by SelfPropelled.